Revolver Music 3 review | What Hi-Fi? We listened to Revolver's £1300, floorstanding Music5s in February 2010, and at the culmination of our five-star First Test asserted that they were ‘fine all-rounders'. Only sensible, then, to get hold of a pair of Music3s to see if lightning can strike twice. Burly for a standmounting design, at 39 x 21 x 28cm, and finished in the same easily smudged high-gloss finish as their siblings (less shiny real wood veneers are also available), the Music3s are a substantial proposition for your speaker stands' top plate. The tweeter is the same 26mm metal dome affair as seen in the Music5s, and they share the same 16.5cm glass-fibre driver – here tuned for midrange as well as bass duties. A reflex port at the rear completes a pretty purposeful specification. And the Music3s don't stray far from the Music5 template where sound is concerned, either. Warm, inclusive and endlessly listenable, the Music3s are as pleasant and unthreatening a speaker as you're likely to hear. A spin of Sonic Youth's Kissability confirms it: the Music3s smooth the nasty jagged edges, soothe some of the stridency from the high frequencies and serve up what can be a fairly belligerent recording with so much sweetness it could qualify as dessert. They're particularly talented in the midrange, where vocals are delivered with stacks of detail and character, but there is a question mark over their timing and tendency to iron flat any dynamic variances. 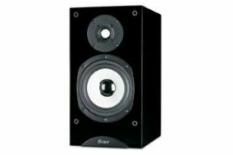 And, of course, the Music3s find themselves pitched into a far more competitive sector than the Music5s – there are more speakers at this price to consider than those shown in the ‘also consider' box. But if you avoid partnering them with similarly cosseting electronics, the Music3s are a front-running easy-going option.